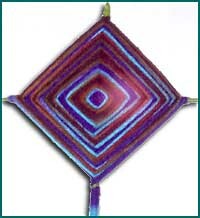 At Midsummer, make a God's Eye as a protective talisman. This Sabbat celebrates the Sun at the height of its glory. As the Sun is a symbol of protection, making this South American Sun amulet is a perfect way to cast your Midsummer spell for protection. We have made God's Eyes using twigs from the yard, popsicle sticks, and toothpicks (using string instead of yarn). By alternating the colored yarn, the finished charm indeed looks like an eye, in this case, the eye of the God watching over us. Its four points symbolize the two solstices and the two equinoxes. As you make your God's Eye, it is important to charge it with your intent. Visualize the safety of your family, belongs, and home as you work. The more detailed your visualization, the more powerful the talisman will be. 1. You can hold the sticks together with your hands while you start winding the yarn, but for small fingers, you might want to glue them together (in the shape of a cross) and leave to dry overnight before wrapping. Loop about 6 inches of yarn and hold against the back of the top stick. Wrap the yarn around both the top stick and the loop. This will become your loop to hang the God's Eye with. 2. Bring the yarn down and wrap it around the left "arm". 3. Wrap the yarn around the bottom "arm", then up and around the right "arm". 4. Wrap the yarn around the top stick and overlap the piece of yarn you have left dangling. 5. Continue wrapping in this way, left, bottom, right, top, until almost all the stick is covered. As a finishing touch, tie several streamers to the bottom and/or horizontal sticks. If you want to get really fancy, use different colored yarn or fabric. Metallic golds to represent the radiance of the Sun would be a nice touch. Or try a bright yellow for the center, then switch to a blue or green. Or use a rainbow of colors for a really pretty effect! Crystals could be attached to the four ends of the sticks and it can be decorated with feathers, shells, or other magickally significant items. Hang the talisman above your door.